My first ever earthquake experience! I must blog about it. Ok, so by now today’s earthquake is old news… I mean, Bennifer is preggers again, the Smith’s are separating… an earthquake on the East Coast is child’s play compared to all of this earth shattering news! However, this was my first ever earthquake and dammit, I’m blogging about it! I’m on the 3rd floor of my building and when I first felt the effects of the earthquake I thought I was experiencing early-onset menopause. Like, for real. I got all hot and woozy and then I started getting all wobbly…. little did I know it was my rolly chair that was wobbling all over my cube. Then I heard this strange “tap, tap, tap” noise. I look over into the office next to my cube and the strings on the window shades are swaying back and forth tapping against the wall. Instantly I thought I was in some sci-fi movie and started to mildly panic. I vaguely remember standing up and grasping onto the edge of my cubical as I’m sure that ever-so-sturdy structure would be the best form of protection. I’ve never experienced a natural disaster before, leave me alone. So anyway, then some guy who is not an LP employee ran into our office and told us to evacuate the building in a hot panic. So I took off for the door… remembered my Chanel bag…. ran back to my desk to grab it, and then ran for the door again. Once outside of the building news started to spread about just how far this earthquake had actually reached and that was a little freaky. After a few minutes passed and we all realized we were okay and everyone we knew and loved was ok we were able to relax and enjoy all of the funny Facebook posts and Tweets. 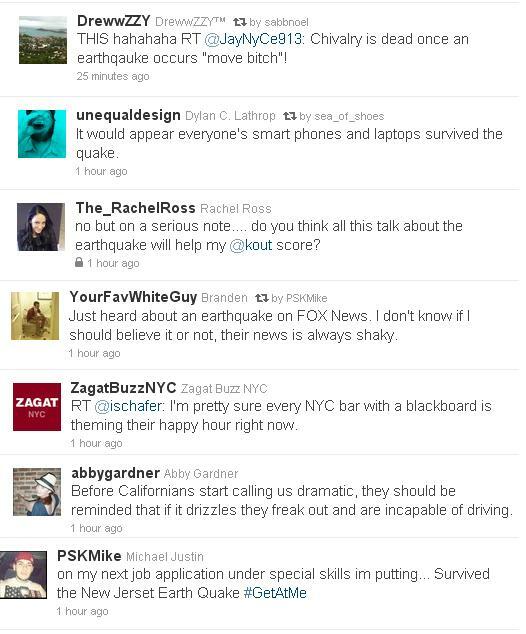 Below are a few of my favorite Tweets (and yes, one of them is mine. I’m funny too!) At some point tomorrow I want to post my favorite Facebook posts as well. I know some funny people, so enjoy! Oh, and wherever you are, I hope you’re ok too! Previous PostPrevious The truth about your skin. Next PostNext A Step in the Weird Direction.